A distinction that inspires confidence in your prospective clients. You've already done the hard work; now apply for the credentials that can help you be more successful in completing your journey. 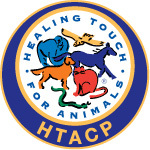 The Healing Touch for Animals® (HTA) Certification process was designed to aid you and the clients you serve as a Practitioner. Certification demonstrates your knowledge and understanding of the HTA energy therapy curriculum and displays an overt recognition of your knowledge and skills. The HTA Certification process is extensive, impartial, reliable and reputable. As a devoted healer, you deserve a respected certification of which you can be proud. HTA Certification Mentorship Teleconferences are available for students who have completed all classes of HTA Level 1 and above interested in pursuing certification. Register today -- HTA Certification Mentorship Teleconferences. Those who desire to submit their Certification packet electronically, please contact the HTA office: 303-470-6572. You will need a current version of Acrobat Reader to view PDF files. Get Acrobat Reader . For a complete list of all approved Reading and Media materials click here. All members of the Healing Touch for Animals® (HTA) Certification Review Board have signed and agreed to the HTA Certification Review Board Agreement outlining their duties and responsibilities. All Board members ensure each HTA Certification Applicant’s packet is reviewed without bias and in a professional manner. All Board members agree to uphold the integrity of the organization and believe in the purpose and mission of Healing Touch for Animals®. Finally, all Board members are considered trustees of Healing Touch for Animals® and have signed an HTA Confidentiality Agreement.